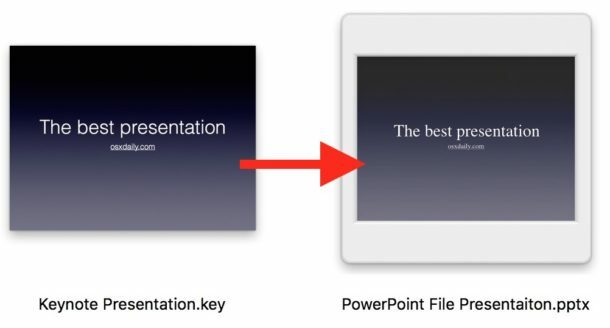 Keynote presentations are saved as .key files by default, but because Keynote runs only on Apple system software and iCloud you can’t always open a .key presentation on PowerPoint. The simplest solution to this is to save a Keynote .key presentation as a PowerPoint .pptx presentation, which can then be opened in Microsoft Office, Google Slides Docs, Keynote, OpenOffice, or just about any other presentation app regardless of the platform it runs on, whether it’s Windows, Linux, another Mac, or even iPad. What we’re going to do is save the Keynote presentation file as a Powerpoint presentation file using the apps Export ability. Essentially this converts the Keynote .key file to a Powerpoint .pptx file. You can do this with a new presentation or an existing Keynote presentation file, it does not matter. For best results you’ll want to update Keynote to the latest version available to your Mac. Note that if the Keynote file is password protected you would want to unlock the file before saving as a Powerpoint file. The .pptx presentation file format is generally more compatible with a broader set of apps and operating systems compared to the native Keynote .key file format, so this can be helpful if you’re working across platforms or there is some compatibility issue with a Keynote presentation. The PowerPoint file format is also generally recognized by most other presentation apps, including Google Slides, Microsoft Office, other versions of Keynote on the Mac, OpenOffice, and even Preview in Mac OS. Similarly, you may find it useful to save Pages files as Word .docx format too, especially if you’re in an environment where you’re on a Mac but other users are on various Windows PC with Office suite. The saved .pptx file will be fully compatible with Microsoft Office and Microsoft Powerpoint, and it can then be opened in those apps on a Windows PC or Mac. 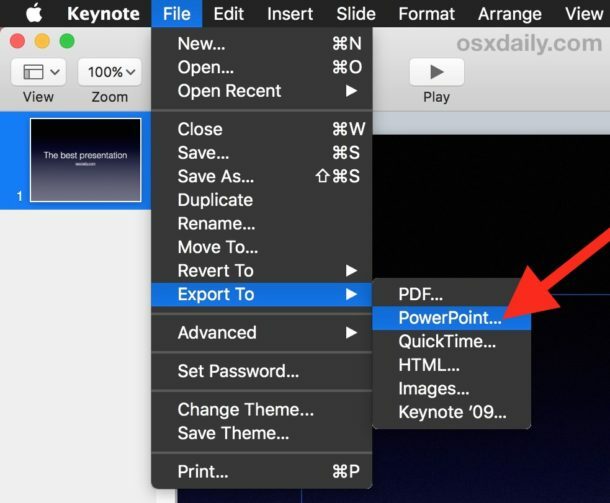 You can also choose .ppt format if you are trying to make the Keynote .key file compatible with a much older version of Microsoft Office and Powerpoint. Remember, the preview versions of Microsoft Office 2016 suite for Mac is a free download, and the Microsoft Office apps for iOS are free to download too, so if you’re on the fence about getting those apps and working with the native Office file formats directly rather than iWork suite you can try them out on your Apple devices first without any particular commitment. 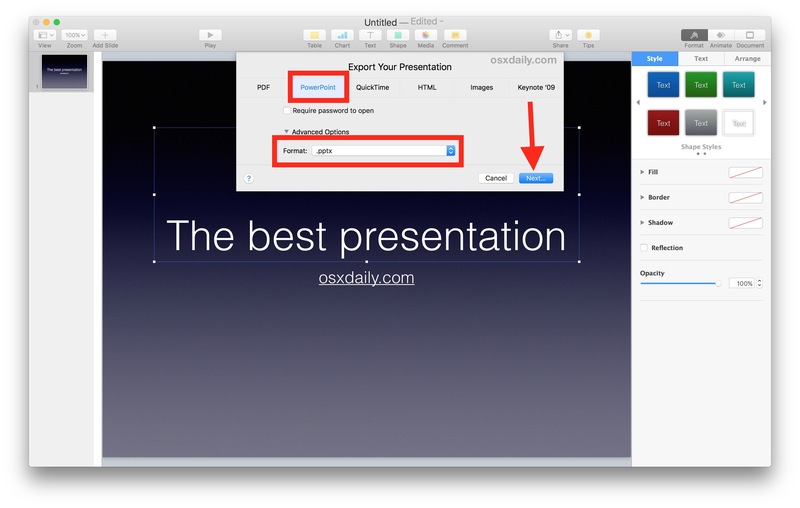 Know of a better way to convert Keynote .key files to Powerpoint .pptx? Let us know in the comments! 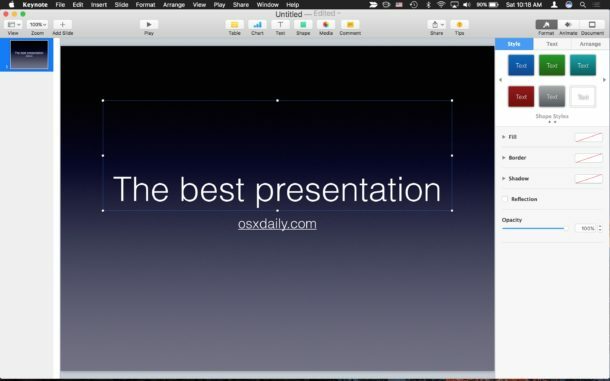 It’s also possible to save a keynote as powerpoint .pptx on iPad/iPhone. Just open the keynote for iOS app and tap on the sharing button (a square with an arrow pointing upwards). Then tap on ‘send a copy’, choose the keynote to be converted, and tap on ‘powerpoint’ when prompted to select a format. A powerpoint .pptx file will then be created ready to be shared with anybody or exported to any compatible app. This procedure can also be used in pages and numbers for iOS to convert to MS Word .docx and MS Excel .xlsx respectively. The alternate method to convert to powerpoint from iOS is to open the keynote app (or pages or numbers for word and excel files), select the desired document and then, with the document open, tap on the ellipsis (three dots, …) on the top right and then on ‘send a copy’. In Step 4 of the example, the exported file’s suffix is .key, for some reason. When PowerPoint files are exported, the resulting file name suffix is .pptx . How do I find out what critical files on my ox Mac desk top are missing, and why do I keep getting errors when I run my word program. If I could get some answers I’d Approbate it. is your word correctly installed, or does it hacked? my suggestion, use “appcleaner” app to completely remove ms applications (all components of it), then install them again. be sure, all components of ms apps are checked while using appcleaner app. empty the trash, restart your mac, then start to install again ms apps. i think so, it will help you. How do you save “pptx” or “docx” or “xlsx” files on iPhone or Mac? Simply use powerpoint, excel and word app (on iPhone free, on Mac… not huge amount). In this case, you can enjoy the ms world benefits. While need to know, pages, keynote and numbers specifications aren’t compatible ms apps exactly, thus some features in keynote, pages, numbers will not appear in ms apps correctly. and viceversa: some features from msoffice will be lost or not appear correctly when converted for opening in pages, numbers or keynote. whats the best conversion way without losing image resolution?? ?